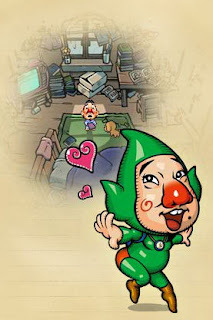 The Gay Gamer: Tingle: Creepy or cute? I'm a bit of a fence-sitter when it comes to Tingle, Nintendo's fairy-loving loser. On the one hand, he can be awfully cute--as he is in the image to the right. On the other, he can be awfully creepy, too--as he is, well, whenever he opens his mouth and says, "Tingle, Tingle, Kooloo-Limpah!" Meagan VanBurkleo over at GameInformer.com seems to be as indecisive as I am when it comes to this unitard-clad character. Don't believe me? Take a look at the list she included in her recent article, "Creepy or Cute? These Characters Walk the Line." The Culprit: Tingle. Evidently love and adoration for Tingle was lost in translation, as most North American gamers find Tingle decidedly disturbing. Not so in Japan, were he has his own breakout title, Freshly-Picked Tingle's Rosy Rupeeland. He's creepy in every sense of the word. I find him incredibly creepy, but as a character, it's endearing. I like him a lot and think he's pretty much perfect in his creepiness.